Lady Liberty has long been the symbol of America, offering the promise of freedom and opportunity to all who pass by her in their journey toward a better life. 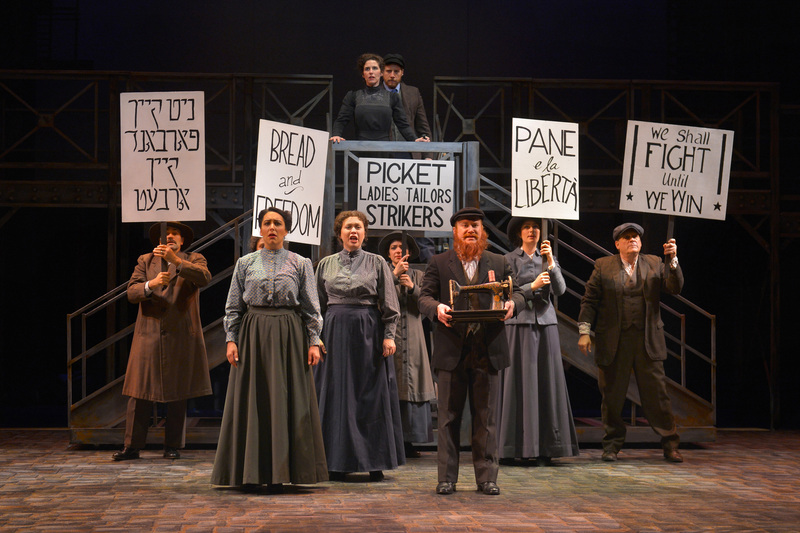 Rags, currently in production at TheatreWorks, takes a look at a community of Jewish immigrants on the Lower East Side of Manhattan (circa 1910) trying mightily to overcome the challenges that face them. It was a difficult time, and these eager immigrants fled desperate conditions and persecution in Mother Russia to build new lives for themselves and their families. From the start, hucksters and thugs are never far away, lying in wait to prey upon the naïve newcomers. Although a period piece, many of the issues in the story are just as relevant in today’s socio-political climate. 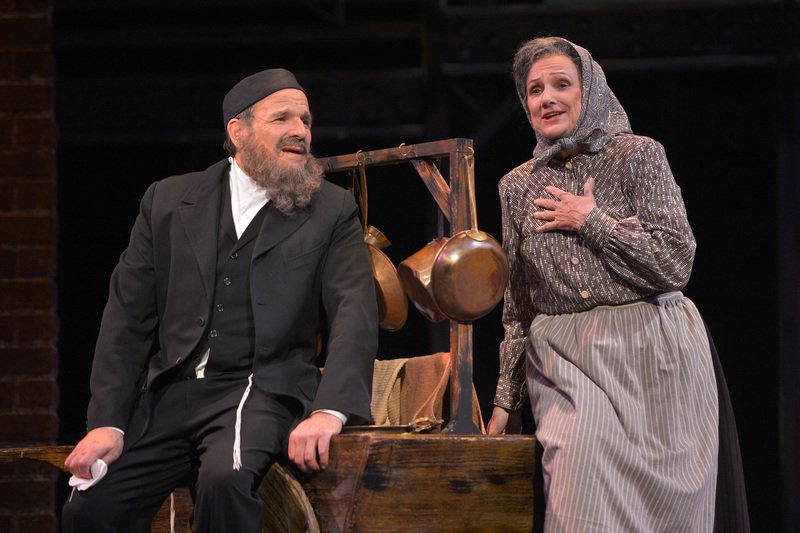 The book was written by Joseph Stein (of Fiddler on the Roof fame), and though he claims Rags is thematically related, it is not intended as a sequel. The characters, although from the same region and of the same era, are not from the same village nor are they related to those known from Anatevka. The music is written by Charles Strouse, and the creative lyrics are provided by Stephen Schwartz. The show had a disastrous start on Broadway, closing after a mere four performances. After being notified that their production was closing so abruptly, that 1986 Broadway cast staged a protest march going so far as offering to defer their own salaries to keep the show going, but to no avail. Since then, Rags has gone through multiple major revisions to tighten the story. 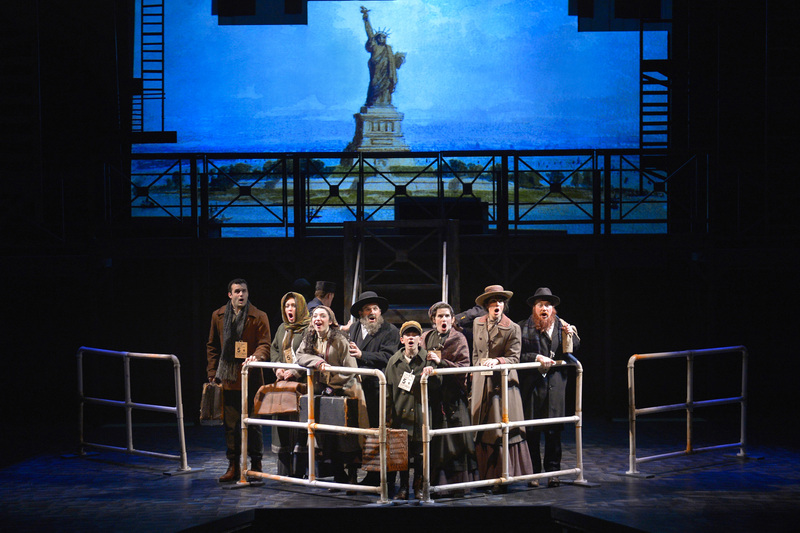 Rags is a big show, and it attempts to cover a lot of ground while following a number of recent arrivals from their landing at Ellis Island through the first year or two of their life in their adopted country. They live in the garment district enduring treacherous conditions during the rise of the labor movement. A turning point occurs when an historic fire at the Triangle Shirtwaist Factory directly threatens one of their own. 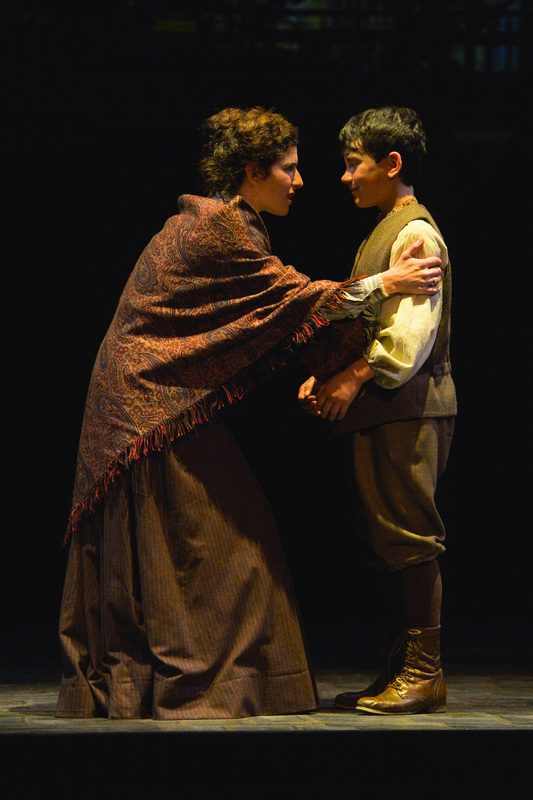 Rebecca Hershkowitz (Kyra Miller) and her son David (Jonah Broscow) are at the center of the story, traveling to America to find Rebecca’s husband Nathan Hershkowitz (Noel Anthony) six years after he first arrived. On the ship, Rebecca and Bella Cohen (Julie Benko) become fast friends. Bella is deeply in love with a fellow passenger, Ben (Travis Leland), of whom her father, Avram Cohen (Donald Corren), disapproves. Upon the ship’s arrival in New York, Bella convinces Avram to protect Rebecca and David as family when they face the threat of deportation for not having a male relative on site to claim them. Except for Ben, they all settle at Avram’s brother’s house. To support himself, Avram hawks pots, pans, and towels from a vendor’s cart next to Rachel Halpern (Darlene Popovic), a fruit vendor. 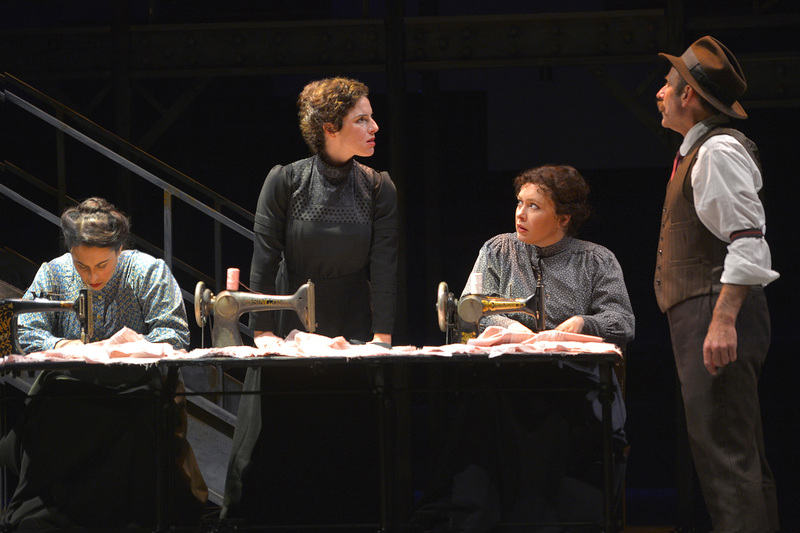 Rebecca finds work in a sweatshop, giving the audience momentary glimpses into the dysfunction in that environment. Saul (Danny Rothman) takes a shine to Rebecca. He’s an “agitator” who is both pro-union and smitten, not initially realizing that she is already married. 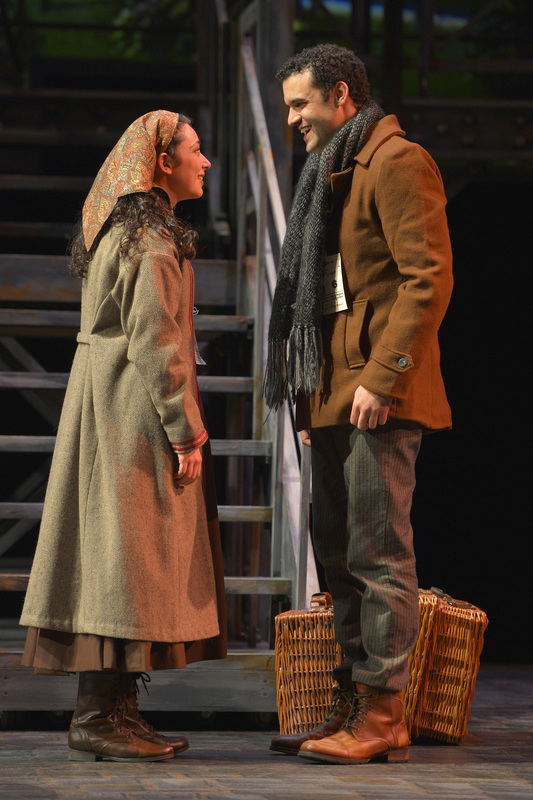 Joe Ragey’s scenic design works well, a fixed bridge is set upstage providing some height for crosses or focus. Scenes are projected above the bridge to add more details of their surroundings. The stairs connecting to the upstage bridge are manipulated by the actors, although at one point in the performance this reviewer attended, the brake appears to have not been set properly. Hints of building façades with lit windows and physical railings slide in and out of scenes as appropriate to show the tenements in the surrounding area. Short platforms smoothly slide actors and props in and out to represent a sweatshop or dwelling accoutrements, and street vendors roll their carts into their scenes seamlessly. As one can expect from a TheatreWorks production, the set movements are choreographed beautifully, occurring without breaking the action except for the scheduled intermission. TheatreWorks’ Artistic Director Robert Kelley directs this production. He first brought Rags to TheatreWorks in 1989, presenting a rewritten version of the show, much to their audiences’ delight. He’s yearned to present it on the TheatreWorks stage again, and now, in 2017 his wish has been granted. In the 2006 rewrite of the script, the story in Act 1 is mostly told as a series of moments with little connecting them and very little character development. The presentation resembles a recap such as one might see in a current television series at the start of a new season. Such a recap device is only effective if the audience has seen the previous episodes, which of course, they haven’t. As a result, instead of guiding the audience through a reminiscence, it jerks them through a series of disconnected sound bites. Part of this flash-moment effect likely results from compressing the plot to laser focus the overall story. A complaint about the original 1986 production was that it was too big, and it had far too many subplots. Much of that has been stripped away, so only the peaks remain, not the foothills surrounding them. Many of the songs are sung as powerful anthems, in large part as individual soliloquies. In most of the cases where multiple voices engage, they aren’t so much singing to one another as they are singing directly to the audience without engaging anyone else on stage. In one of the exceptions to the laser focus, Saul takes it upon himself to teach Rebecca and David the ways of America. As part of this education, he treats them to a night at the theatre to see a Shakespeare favorite. The Hamlet sequence is a stark departure from the darker story, presenting a farcical, somewhat interactive outing to the local Jewish Theatre, with “Hard to be a Prince” not sung as an anthem, but more as a riotous expose’. The other exception to the Act 1 anthem motif occurs in “Penny a Tune.” This is a delightful Klezmer number showing the vibrant activity and comradery evident between the street vendors in this immigrant community. The music is lively and very ethnic, and some wonderful clarinet work stands out. The staging is slightly off though. Two actors dance with a clarinet and a violin, but they don’t convincingly match the music which can cause a little cognitive dissonance for those with the appropriate musical training watching the action. In Act 2, the story has much more cohesion, and the characters are more fully drawn. One of the high points is a captivating sequence of connection and resolution between Rachel and Avram in the number “Three Sunny Rooms.” A complete story unfolds that is quite satisfying overall with only a momentary flash of incomplete staging. A lyric line has Rachel referring to passersby who aren’t actually there. Sometime later, a single customer stumbles into the carts, but that entrance seems misplaced while at the same time amplifies the missing background street activity in the scene. Even so, Corren and Halpern have some chemistry here, showing a tenderness that is very touching. One bit of anachronistic Act 2 staging occurs at the very end of the show. While the event is still taking place in 1911, the scene is staged to simultaneously show immigrants arriving at Ellis Island in both 1911 and 2017 based on the passengers’ attire. Clearly this is intended to bring home the point that in many ways, at least with respect to immigration, the issues haven’t changed that much, but it comes across as rather inconsistent given Ellis Island ceased to be an immigrant inspection station in 1954. The interactions between Rebecca and David are at times quite touching. Miller and Broscow capture that mother-son relationship well, though vocally their voices don’t always blend. Broscow is sometimes a little harsh at the top of his range accentuating a Broadway belt; whereas, Miller has a more classical arc and tone. Still, Broscow embraces his role as David with gusto, and his interactions with Miller, Rothman, Halpern, and Corren, appear very natural. Miller and Rothman show plenty of fire during the hostile portion of their characters’ early conflicts, but the tenderness that should evolve isn’t entirely convincing. Miller and Anthony show a more believable arc. At first as tender, yet tentative strangers when Rebecca and Nathan are reunited. Through Act 2, they slowly grow apart, Rebecca eventually realizing that she and Nathan have diametrically opposed goals and beliefs. Their characters’ separation is painful, and convincing. Benko and Leland have some very nice scenes together, tenderly testing the waters of their characters’ chaste and forbidden romance. Despite the plot and staging difficulties, the show has plenty of punch, and the music is luscious. William Liberatore’s orchestra is pitch perfect and adds all the right touches, particularly in the klezmer and ragtime segments. Vocally, the cast is strong overall, in many cases tending toward operatic in style. The lack of diversity in intensity seems to be more a function of the material, not artistic interpretation. Rags is entertaining. It is also a serious and intense piece of theatre with a bit of humor judiciously scattered throughout the story. It offers another perspective to the ongoing immigration issues still facing the U.S. and the world which is worth seeing. See http://theatreworks.org/calendar/2016-2017-season/rags/, email boxoffice@theatreworks.org, or call (650)463-1960 for more information or to order tickets.